Three hours cutting to finished! Same fabric, same pattern, same yardage, different size robe for my mini me, my Mom. 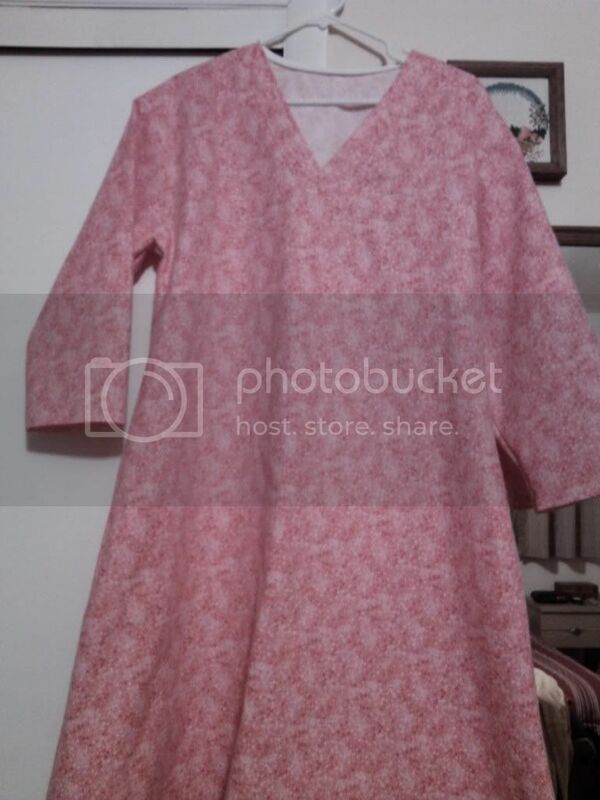 If this fits and she likes the neckline, I'm going to make her some nightgowns from this pattern with the NINE YARDS of flannel I found in the closet yesterday! UGH!!! Actually there is probably about 18 yards because I only washed what was suitable for me/mom and not what I had to use for the DGSs. I forgot it was in the closet. I really am addicted to fabric. 3 yards of the 'found' flannel used to make my mom a nightgown. If she likes it, there's a lavendar piece just waiting to be cut and sewn this afternoon. I LOVE feeling creative! Wow Pam, awesome work you're doing! I love the ribbon quilt! Well I am finally feeling better. I still have a dry cough, but that is pretty much it. I haven't had the energy to post much lately, so I'm sorry for not letting everyone know how much I like their projects. Love the pink ribbon quilt, and the nightgowns look cozy. I like the style, it looks like a quick project. If you have the pattern number handy, I would like to add that to my arsenal! I finally finished some of my Christmas sewing. Today DH delivered 28 lanyards to his work peeps (they wear name tags), and the lanyards count for only 2.5 yards of fabric. Right before supper tonight I finished the back packs for my work peeps (we don't wear name tags). I made a few extra for volunteers and such. The 12 backpacks count for 4 yards. Not much, but I am glad to have finished them. I won't get to the Christmas pjs until tomorrow or later, but hopefully I will get them done before winter is over (we have a very short winter down here). I finished this last night right before we walked out the door (at 5pm) to go to DDs house for New Year's Eve dinner. 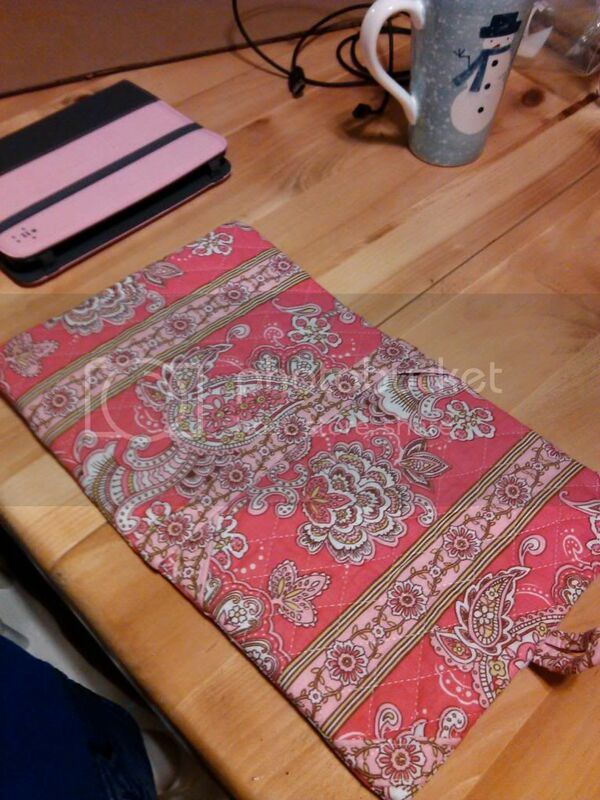 She got a tablet from DSIL and couldn't find a cover so she bought a pattern instead. She knew I had something in the stash to make it for her. It took about an hour and about 1/4 yard of fabric. The hardest thing was cutting the cardboard that goes between the layers to make it 'protective'. You can't really see it, but there are pieces of the contrast fabric making 'straps' to hold the tablet in place. It was See & Sew pattern #B5841. The nightgowns are from Simplicity 3935, which is a pj top and pants pattern that I just added length to the top to make the nightgowns. I had a pair of pjs cut out and made in 2 hours last night after we came home from DD's. I started at 10 and when the ball dropped at midnight, the only thing left is to put in the elastic. 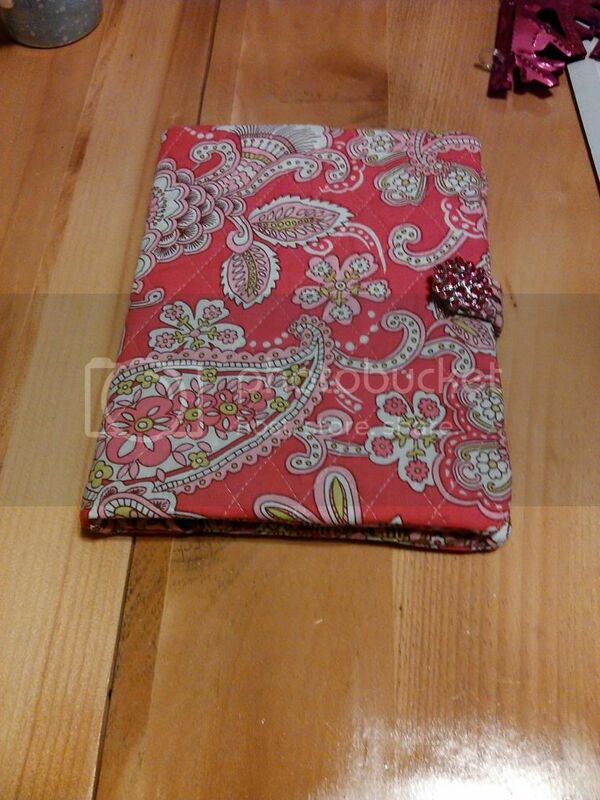 (it wasn't stash fabric ~ that would have added 5 yards). It feels good to be sewing this much.